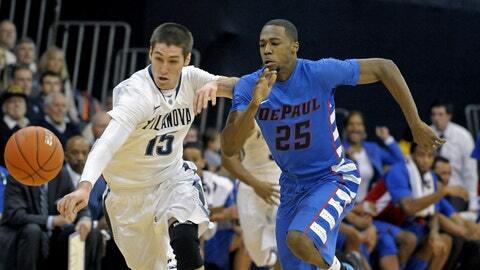 Villanova guard Ryan Arcidiacono (left) battles for the ball with DePaul's Durrell McDonald. Painted on the wall inside the practice facility of the nation’s fourth-ranked team are three phrases: "Play Hard. Play Together. Play Smart." Beware: At Villanova’s Davis Center for Athletics and Fitness, across the street from The Pavilion, these sorts of basketball cliches are as ubiquitous as they are true. Players talk about the theme of their unexpected 16-1 season: "Humble and Hungry." They refer to games like their November upset of Kansas as "a Villanova basketball game," by which they mean a game where they didn’t necessarily shoot well but grinded and battled and simply outhustled their opponents. They speak about playing with a "road attitude," where they’re always playing with their backs against the wall. Beneath every word spoken by this team is the perfect basketball cliche to describe a team that plays together: For Villanova, the most surprising team in college basketball this season, the whole is greater than the sum of its parts. "Some people say we’re not very talented," sophomore guard Ryan Arcidiacono told me last week when I spent a day around the program. "We’re scrappy. We all dive on the floor, take charges, play our best defense all game." Opponents roll their eyes at their peril. One afternoon in the Philadelphia suburbs last week, before Villanova’s big home game versus 15-3 Big East rival Creighton Monday night, I watched coach Jay Wright run what might have been the most efficient practice I’ve ever seen. When players were running drills, they shouted with one voice. The practice routine seemed so familiar that the Wildcats didn’t even seem to need coaches to tell them what drill was next. This was not a country club; this was work. Wright treated his players as adults. There was no blaring music, but there was plenty of encouragement among teammates. And it wasnât some insane shout-fest, either. Wright and his staff seemed intent on teaching and refining the swarming, trapping defense that has the Wildcats ranked as the eighth-most-efficient defense in the country, according to KenPom.com. "Execution defensively is what’s going to win us games," Wright told his team during one break. At another stoppage, I saw a different great basketball cliche in action. Sophomore big man Daniel Ochefu was going up for a rebound when a teammate went over his back. It was an obvious foul, but the Villanova staffer who was reffing didn’t make the call. (I later learned from Wright they do this on purpose to test their players.) Instead of protesting and getting mad at the slight, Ochefu turned his back and clapped his hands. Wright stopped practice to recognize Ochefu — not for some super-athletic play but for the type of mental toughness that makes teams like this overachieve. That’s a typical type of thing for Wright and his staff to focus on. They won’t gush so much over a player making an open three as much as they gush over the good ball movement that got the player that shot. All this is good coaching, and great teamwork, in action. Arcidiacono told me this team truly feels like — cliche alert! — brothers. All summer these guys practiced together, ate together, lived together. Eight guys would go to a movie together. They’d visit Arcidiacono’s family’s house in nearby Bucks County. They’d all pile into three cars and head to a Chipotle in an adjacent town four or five times a week. "It separates us from other teams," he told me. "I know we aren’t the most talented, athletic team. We just have one common goal." Is it tough to not let the recent national attention affect that grinding mentality? "Summer, we were all grinding, nobody thought of us then," Arcidiacono said. "Why would we change our mindset now that a few people voted for us?" "He’s been here long enough to have established a culture and what our core values are," said athletic director Vince Nicastro, who hired Wright. "He looks very refined, very intelligent, very articulate, but he’s a junkyard dog in terms of competing. And that’s the way his teams play. His teams are tough and gritty and get every 50/50 ball." After watching practice, I went to a nearby pub to be a guest on Wright’s radio show. The place was packed with Villanova fans, and Wright held court. Afterward, I sat down with Wright, his wife and his longtime best friend — Wright’s a Philly kid who grew up a Villanova fan — to figure out how to build a program that takes every coaching cliche and puts it into practice. He told me the key is recruiting the right guys — not necessarily the five-star, one-and-done players but guys like senior forward James "Taj" Bell, the floor leader and hustler who might be this team’s MVP. "We want to work on our attitude and our approach to challenges," Wright told me. "We have made some mistakes in that area — not in bad character but in not being interested in your attitude more than your game. It’s an attitude that fits the culture of our schools." If I had to boil down the Villanova philosophy to one phrase, it’s that there’s no space between players. I mean that metaphorically — these guys are genuinely close — as well as literally. Even in practice, there are very few gaps in their defense. One player helps, another rotates to cover. They all seem on the same philosophical page. That’s a rare trait in college basketball. This team does have NBA-level players — like talented wing Jayvaughn Pinkston and Bell, who Wright believes could play in the league because of his solid shooting and ability to be a lockdown defender at multiple positions — but these guys truly don’t get caught up in that. Not now, anyway. Now they’re ranked fourth in the nation, atop the new Big East and always focused on today’s practice before tomorrow’s game. "If a guy comes here with a one-and-done mentality, all of the sudden we’re asking about what you can do for your teammate, and how much you want to be part of something bigger than yourself," Wright said. Fine: It’s all one big, fat basketball-coaching cliche. But coaches use cliches like these for a reason: Getting players to believe in something bigger than themselves means playing as a team that’s primed to win. And I’m not sure if any team in college hoops is as mentally tough, and as much on the same page, as Wright’s young men.